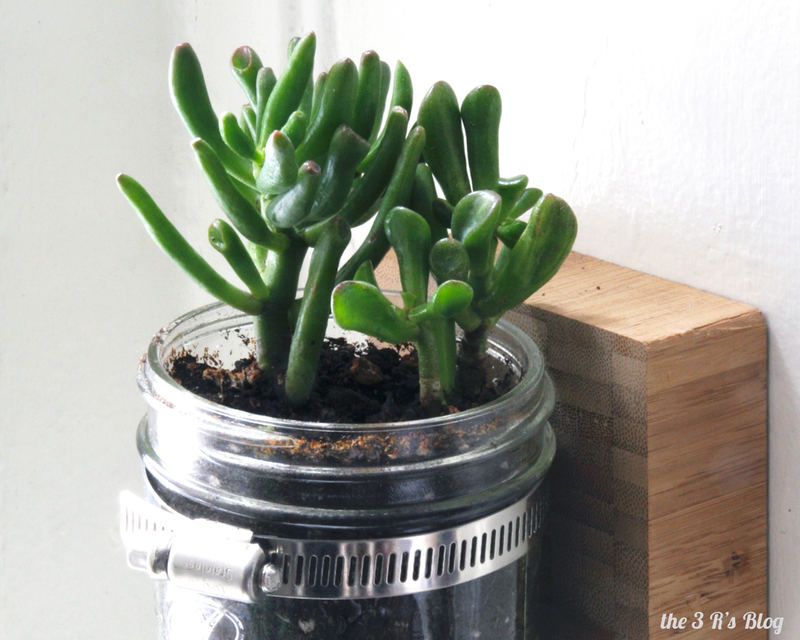 ← Cacti and Succulents and Planters, Oh My! I’m sitting here in my very cold living room wondering why if the temperature outside is 31 degrees there is no heat coming out of my radiator. Burrr!! So as you might be able to tell, my thoughts have been very much on Spring recently and as I mentioned in my previous Plant Pods post, I have been a bit obsessed with succulents. If I haven’t mentioned it before, I LOVE succulents. Partly, they are the only thing I am able to successfully keep alive on my dimly lit window sill, and partly I think there is something about the different shapes of their leaves that really appeals to the architect in me. Anyway, I am super excited to be sharing this project with everyone because not only does it feature succulents but it is a project that I spotted on Pinterest a long time ago and have been wanting to try out for ages! 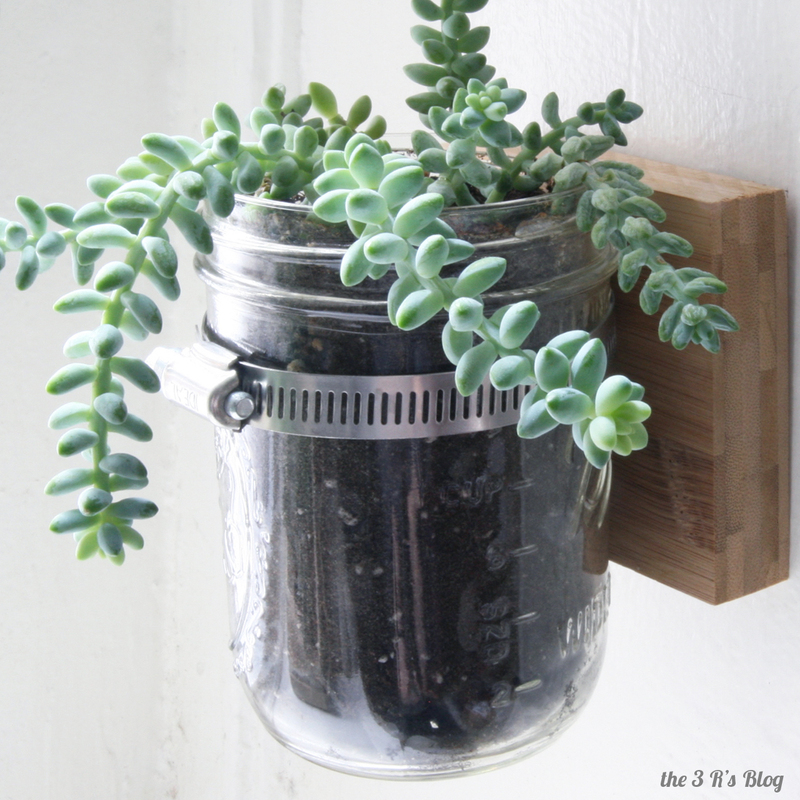 The original blog post that I found via Pinterest had a series of 4 mason jars attached to a longer board that they were using for bathroom storage. Which I loved, and immediately thought would look super cute holding art supplies like pencils and crayons. And I actually ran out and purchased the mason jars and the pipe clamps, and just never got around to making the project happen. But then a few weeks ago I was in the midsts of a winter cleaning and came across this old architectural sample book featuring square samples of Plyboo, which is plywood bamboo that you can buy in sheets for flooring or cabinetry. I realized that it was completely ridiculous to save this sample book since I have no plans on being an architect any time soon, but if I could rip the samples out of the book I’d have a whole set of different square pieces of Plyboo to use for other projects. And thus my little planters were born. First before anything else you need to address how you are going to hang your piece on the wall. If I was going to make a larger piece with multiple mason jars I would probably attach some sort of picture hanger to the back, but since I was using these small squares I really wanted them to hang flat against the wall, so I decided that if I drilled two deep holes in the back of the wood and then hammered two long nails into my wall it could hang nicely off of those nails and still sit flat against the wall. So the very first step I did was drill two deep holes into the back of my Plyboo sample. (You can see these holes in photo 5 in my photo collage below.) I found this worked really well with my first sample that was almost 2 inches thick. Unfortunately that was the only sample of that thickness in my sample pack, and the second one I made had to use a piece that was closer to 1 inch thick. This two hole technique didn’t work to well with this thinner piece and the weight of the jar pulled the whole piece off of the wall, so I had to add a third triangulated hole to the back after I had finished. This worked ok, but for future planters I might think about if there is a better technique for hanging it flush against the wall. I’ll get back to you if I discover one in the future. Next you are going to work on the front of the piece of wood, and you will first want to open the pipe clamp up so it can lie flat on top of the piece of wood while you are screwing it into place. This will make everything a lot easier, trust me. Next you need to screw the pipe clamp into the piece of wood. All other tutorials I saw just sort of glossed over this part, but what I discovered when I started was that the little slits in the metal clamp are not nearly large enough for a screw, but the metal is also super strong so you can’t just cut a bigger hole yourself. What I discovered worked best was to first pre-drill the screw hole into the wood. This may have only been necessary because I was using the Plyboo which is a really hard wood, but it would probably be helpful for anyone. Then, you get a large fat nail, about the same size as your screw, and hammer it into the hole you’ve pre-drilled, through one of the small slits in the pipe clamp. This should push the two slits apart and make a larger hole that you can then screw through. (See photos 1 and 2 in my How-To photo collage below.) Of course I found getting the nail back out to be a bit tricky, but with a bit of wiggling and some muscle it finally came out. You should then have a large enough metal hole that you can relatively easily screw through the pipe clamp and into the wood. Photo 3 shows what it should look like once the pipe clamp is screwed into place. And with that you are pretty much finished! 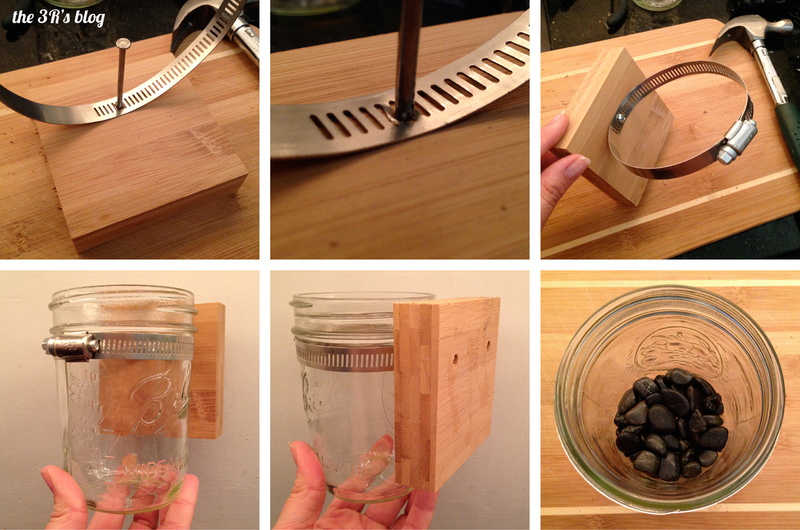 You will want to insert your mason jar and tighten the pipe clamp so it holds the jar securely in place. Luckily all mason jars have a lip at the top so even if the clamp is a bit loose the jar won’t slip out. Finally it is time to plant! The most important thing is to fill the bottom of the jar with pebbles so you have good drainage, since there isn’t a hole in the bottom of your jar for the water to escape through. This is especially important if you are planting something like succulents or cacti which don’t like to be over watered. I used black pebbles because I liked that they blended in color wise with the dirt. Of course you could also have painted the exterior of your mason jar first so you wouldn’t see any of the dirt, but I kind of like seeing it all. Plus it makes it easy to see how much water you’ve added! So far I’ve only made two hanging planters, but I might make more as time goes on. I’ve hung them on the inside of my deep inset window, so I could theoretically keep hanging more planters up the height of the window if I wanted too. We’ll see. If I had a large wall that got a lot of sun I can see these dotted along the whole wall with different sort of plants, maybe a few which are left empty for cut flowers or candles. The possibilities are endless! I also am still thinking of using a longer piece of wood to hang a few jars in a row that I could then use for pencils and scissors and other desk supplies. How cute would these look filled with crayons, markers and color pencils in a child’s room. And the beauty of the system is you can easily pull one jar out and carry it off to a table if you are using those particular art supplies at that time. I hope this post has made you think a bit about Spring, there is still a lot of snow on the ground here in NYC so I think we’ll have a while before there is anything super green to look at outside! So it is even more important for me to have some greenery inside my own apartment. 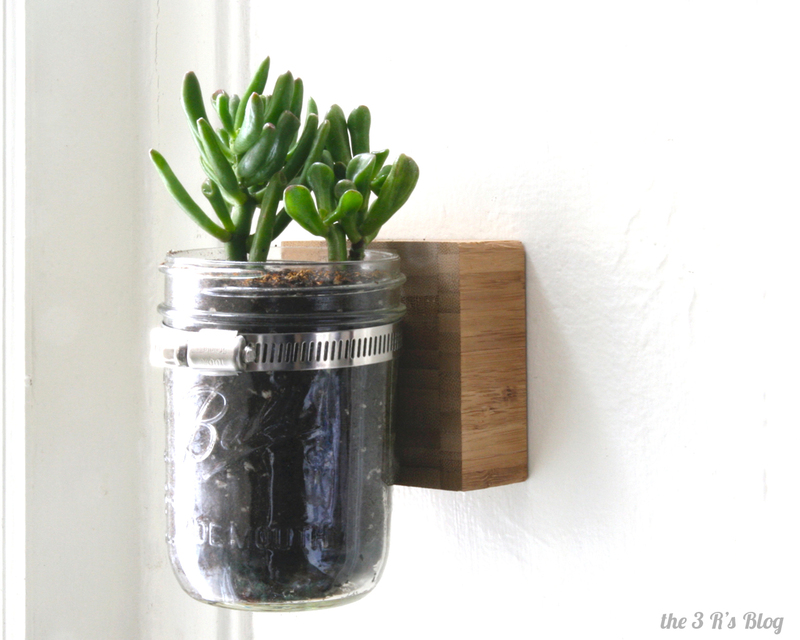 Has anyone else tried this hanging mason jar project in their own life? What did you use the jars for? I would love to hear about all of your projects. These are super cute. I hope you’re feeling 100% yourself soon. This is so great. How do you hang it on the wall? The paragraph directly after the list of materials describes the nuances of how it hangs, or should I say the problems that arose from my technique, but basically I drilled holes in the back of the piece of wood and then hung it on two nails in the wall. This allows it to hang flat, but was a bit problematic so I might recommend some sort of picture hanger. Really such a wonderful idea! Great! Thanks for the post! I think it is brilliant! Thumbs up! Where did you find the wood? Home depot or lowes? I had these Plyboo (bamboo plywood) left over from a sample book/catalogue that I took home from one of the architecture firms I worked at during a massive material sample clean out. But I think you can find Plyboo at a large store like Home Depot. Try googling “bamboo plywood” and see what you find? Sorry not to be more helpful! I luv this idea & have all materials gathered…I’m stuck on getting pipe clamp slits open….I’ve tried yor technique to no avail…..like u said they r super strong….even tried needle nose pliers…any more suggestions?? What are the plants used in the pictures?? They are some succulents I bought at a local store, I’m not sure what they are called. If you want to try and find something similar I’m a big fan of ordering online from Mountain Crest Gardens. Huge fan of these succulents! Top one is Ogre Ears (Crassula ovata ‘Ogre Ears’) and the bottom is a Burrow’s tail (Sedum morganianum). Pingback: Creare una fioriera originale riciclando! 18 idee... Ispiratevi!!! Ok so I know it’s been 4 years since you’ve posted this lol BUT its about amazing idea and perfect for what I’m making (I hope). I am trying to make a planter just like this for a friend. Only difference is for the pots I will be using 4″ galvanized steel pots, only about 4 oz without the plants. How much weight will the metal clamps hold do you think? 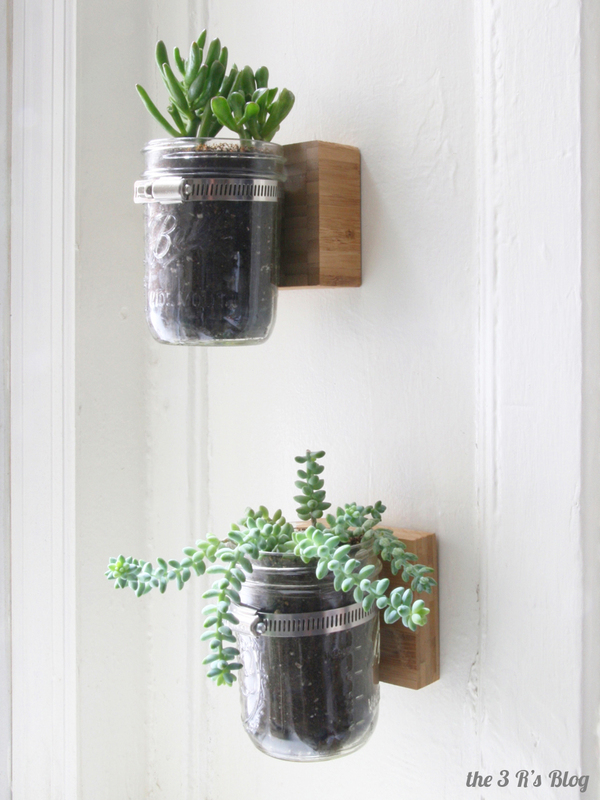 How much weight would you say is your Mason jar with your succulents? Gosh, I really don’t know. But maybe someone who works at a hardware store might? Since you’ll probably need to buy them there. But remember my ‘pots’ were glass jars which are pretty heavy on their own so your light pots would probably be fine. Just a guess. My Easter tree is blooming right on schedule! I’ll post some of my favorite eggs in stories. It was a beautiful evening in the park. Look what I made! Her name is Olivia Wal (that’s 🐋 in German) and she is now living in London with my niece! I’ll definitely be posting more pics because she’s the most complicated knitting project I’ve ever undertaken and I’m so darn proud!! One of my favorite stops in London was the Design Museum. The building is incredible, plus there was a fabulous exhibit about David Adjaye up at the moment. Entrepreneur, small business owner, Science teacher, Architectural School graduate, proud crafter and mom to the best dachshund in the world.